A month or two ago, in the downtown area of our tiny little suburb right outside the City of Brotherly Love, my wife and I found ourselves hunting for some vittles one bright Saturday morning. We settled on a new diner/cafe right on the main street. It was a quaint mom and pop's joint. It reminded us of a little place we used to go in Hollywood called "The Corner." Now, my wife Sonia usually eats an hour or two after she gets up, whereas I am in the habit of eating at least a little bit of something immediately upon waking, usually accompanied by a caffeinated energy drink of some kind. That meal, a true break-the-fast is often very small, allowing me to eat a little more a little later and join Sonia when she finally does eat breakfast. Inspired by our good friend Peregrin Took, Sonia and I refer to that latter meal as my "second breakfast." But second breakfast can't be as big as a normal meal, since it's book-ended by first breakfast and elevensies. So when I searched the menu at this little cafe for a small-ish meal and declined when offered a hashbrown add-on, our waitress of course decided that I must be a cheap SOB and that she would undoubtedly receive little or nothing in the way of a tip. We received little or nothing in the way of service after that, as our waitress strived dutifully to fulfill her own prophecy, but when my meal finally came out (pancakes with lemon curd) everything in the world was right as rain. I was delighted at the tart, tangy, lemoniness of the curd. 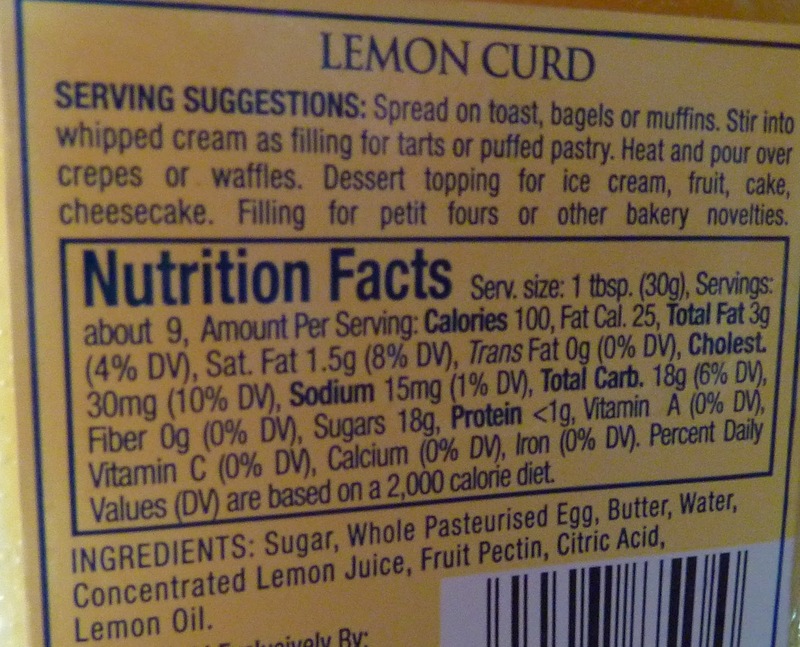 I was upset that something so delicious would be called "curd." I giggled like a schoolboy as I smeared it 'round my flapjacks. Then I literally licked my platter clean. Sonia, apparently offended by the streams of yellow drizzle on my face, said to me flatly, "You know they sell that stuff at Trader Joe's." My eyes widened at the realization that I wouldn't have to go back to this goofy little diner for lemon curd. BUT, would TJ's version taste as good as the poor-service cafe? 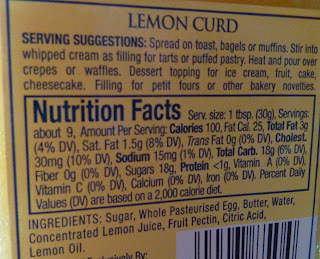 In the time that's passed, I have confirmed that YES, TJ's version is every bit as good as the one I had at that diner, and in fact, that the two taste so similar, I'm guessing the cafe's lemon curd "supplier" IS Trader Joe's. It's got the consistency and feel of honey, but it's RIDICULOUSLY lemony. It made me want to scream "Lemony Snicket!" like I did when I ate the Lemon Bars. It goes well with pancakes, with toast, with scones, with cookies, or just about anything you want to taste like lemon candy. It's super sour, but also super sweet. I'm in love with it. I don't know if anywhere else sells this stuff in the states, and I'm pretty sure Trader Joe didn't invent the stuff, but I'm going to give TJ's the credit for introducing me to it. 5 big stars from me. 4.5 stars from Sonia. 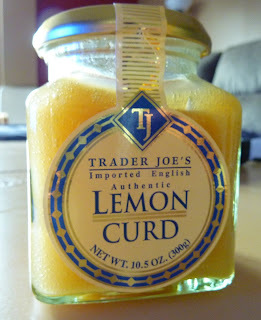 Haha :) I'm pretty sure you can find lemon curd at just about any grocery store these days, but we can still give Trader Joe's all the credit! It would also be good with a biscuit (or scone, like you said) and some cut up fresh strawberries... a tasty desert for a hot summer night! Whaaat? I've never seen it at regular grocery stores, Kim...granted, I haven't been looking. 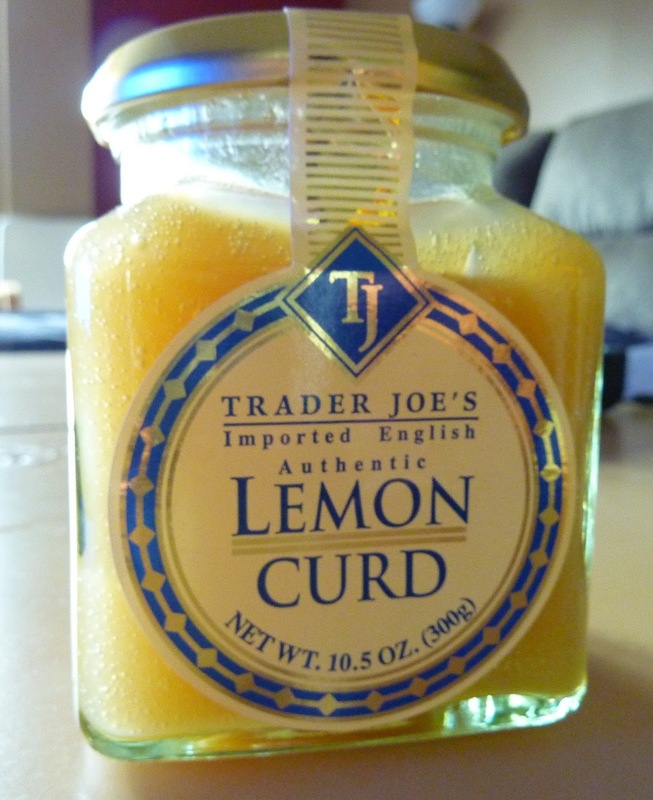 I don't know if TJ carries it, but a equally delicious alternative is orange curd. guys, you can make this stuff! and it's not very hard. This is my all time favorite TJ thing! I LOVE it. I am a lemon curd freak. I have made cups of the stuff at a time at home (always the best, and you can lick the spoon or even the whole saucepan). The only brand I've tried that comes close to homemade is Tiptree. Can't wait to try TJ's. They've just come to Boulder, where I live. Just FYI, it's ridiculously-easy to make your own.